Jaguar and LandRover owner, Tata is preparing for a full-scale European launch – including the UK – in 2010, with both the tiny Nano city car and a fully-revised Indica B-segment hatchback – including an electric version. But the launch will not use the Rover brand – which Tata acquired through its purchase of Jaguar and Land-Rover. Instead, the Tata brand will be used worldwide for small cars. 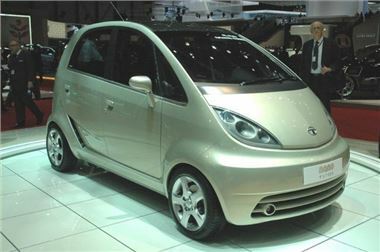 Tata chairman Ratan Tata was at the show to unveil a revised ‘Europa’ version of the tiny Nano, which will go on sale in India, priced around $2,000, in April. It’s just 3.29 metres long and 1.58 metres wide, but the Tata Nano Europa has a slightly longer wheelbase of 2.28 metres. The biggest changes are under the skin. Nano Europa will be powered by a 3-cylinder all-aluminium MPFI engine with a 5-speed automatic transmission and electric power steering. This will address one of the complaints about Nano – that it’s not as green as it could be. Ratan Tata said the gasoline engine will provide CO2 emissions of less than 100g/km. Inside the car, fit and finish has been enhanced over the India-market Nano, and the Nano Europa has ABS, ESP and air bags. Also on show was a concept C-segment saloon, the Tata Prima. Styled by Pininfarina, it is expected to go into production around 2012, and will form part of the Tata range alongside Nano and Indica. The battery-electric Indica Vista EV is a true four-seater, with a predicted range of up to 200km and acceleration of 0-60kmh in under10 seconds. It is currently undergoing extensive tests in Europe. The EV uses super polymer lithium ion batteries which have superior energy density to conventional batteries. Tata electric vehicles will be produced in association with Miljo Grenland/Innovasjon of Norway. Tata Motors’ UK subsidiary, Tata Motors European Technical Centre plc, has a 70 percent stake in Miljo.